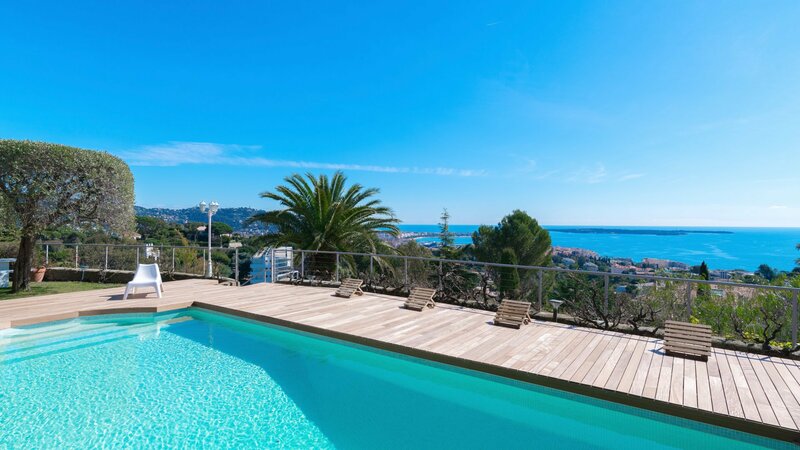 CA-CAR1217 is located in the hills above the city centre, this magnificent property has everything you need for a luxury holiday to remember in the world renowned city of Cannes. 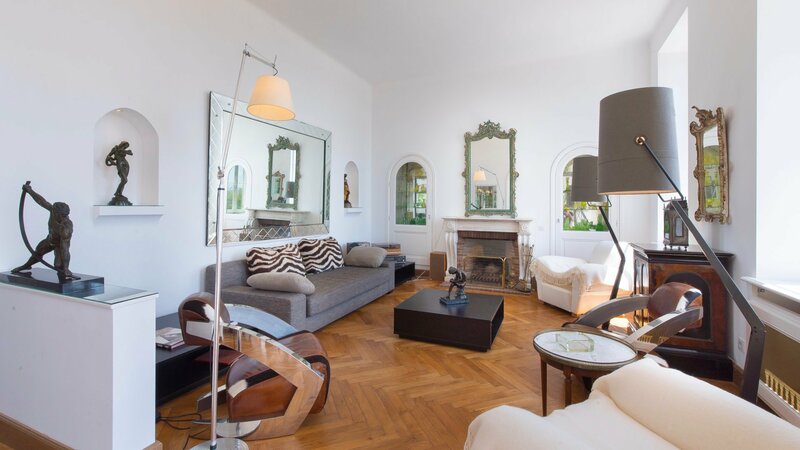 The villa has 6 luxurious bedrooms and 4 bathrooms plus a spacious living area featuring a reception room, library and 2 entertainment rooms.The interior is both stylish and eclectic with a fabulous mix of collectibles and contemporary pieces on display throughout the house. The ground floor opens directly onto a large sunny terrace with a lounge area plus dining table for breakfast or morning coffee. There are several patios areas dotted around the grounds and the fabulous outdoor swimming pool has its own sundrenched wooden deck with sunloungers and a dining area. 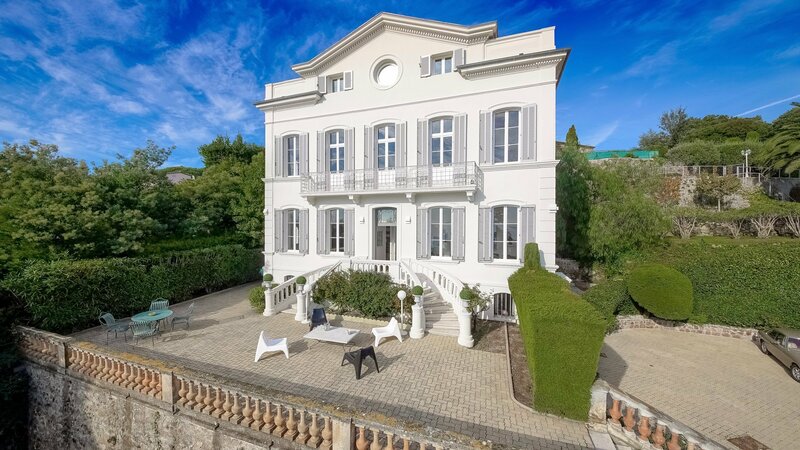 Just minutes away from the chic private beaches and glittering nightlife of Cannes, the villa is set in the exclusive Croix des Gardes neighbourhood. Surrounded by lush greenery and overlooking the Mediterranean, this is the perfect spot to relax and unwind. 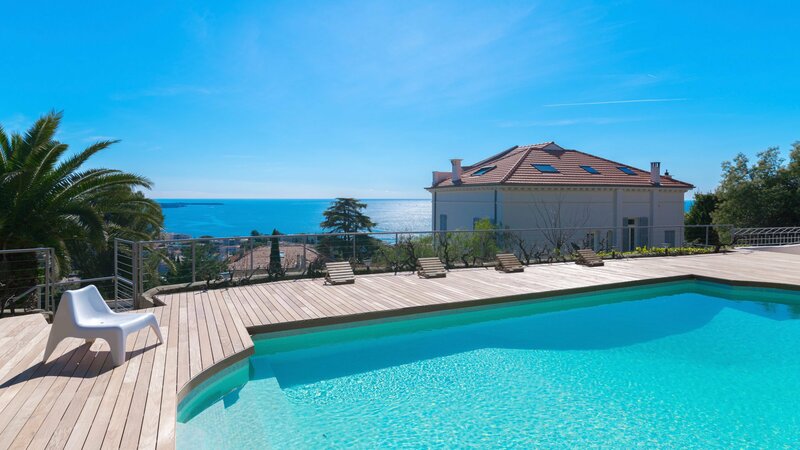 There are 2 country clubs a short drive away from the property, and down on the coast you’ll find an exciting range of watersports for all the family to enjoy in both Cannes and Antibes. Charming and traditional, this wonderful 6-bedroom property with its idyllic hillside location is a dream holiday home. Set amongst Mediterranean olive trees and umbrella pines, the villa overlooks the Bay of Cannes and the fascinating Iles de Lérins. Decorated in sophisticated neutral tones with touches of exposed wood and brick, the house acts as a showcase for the fabulous collection of vintage furniture and accessories displayed throughout the main living space. Spacious and filled with light, the garden floor lounge area and entertainment rooms provide a luxurious place to relax, while on the upper floors the comfortable bedrooms have some of the best views in town. The villa’s main living area is on the garden floor. 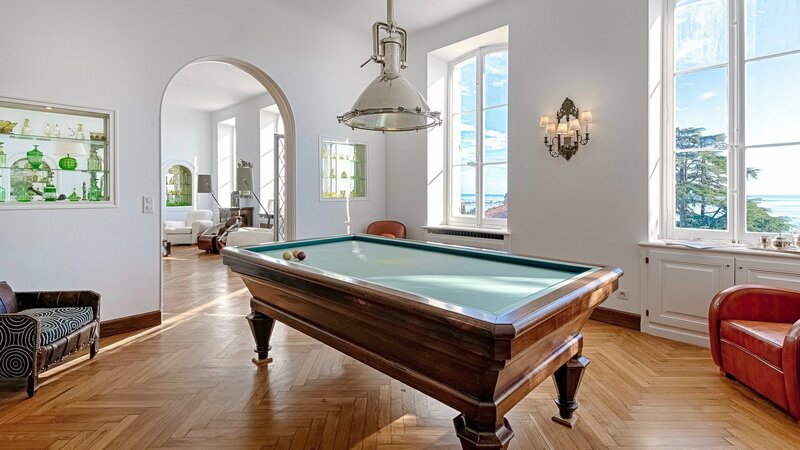 A sunny living room with a comfortable seating area and many unusual objets d’art leads into the games room which has the feel of a gentleman’s club thanks to the wood paneling, leather club chairs and magnificent wooden pool table. 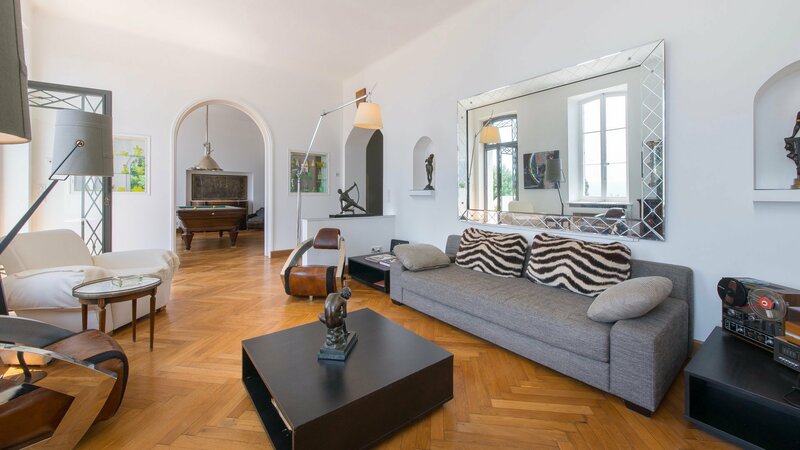 Both rooms are decorated in white with herringbone parquet floors and open onto a large terrace with stunning views of the garden and the Mediterranean below. The large, fully equipped kitchen is an elegant mix of modern design and classic Provençal style. The neutral grey and white walls are complimented by the warm wooden tones of the cabinetry while the traditional red range with its impressive tiled backdrop really draws the eye. A great space for cooking or entertaining thanks to the cosy eating area in the centre of the room, the kitchen also has direct access to a shady courtyard for al fresco dining. Also on the garden floor is the villa’s well-stocked library. With a comfortable seating area, a high-tech entertainment system and shelf after shelf of books to choose from, this cosy wood paneled room is sure to be a favourite with the whole family during your stay. The villa’s 6 bedrooms are spread out over the first and second floors of the property and each bedroom is decorated in a different style with glorious views as standard. The spectacular master suite on the 1st floor comes complete with a large dressing room and ensuite bathroom for total privacy while upstairs, you’ll love the charming 2nd floor bedrooms with their sloping ceilings and exposed wooden beams. There are 4 functional and stylish bathrooms in the villa, all of which are equipped with high-quality fixtures and fittings. Several of the bedrooms are ensuite, whilst the remaining rooms share a private shower room. The bedrooms on the first floor share an intimate TV and reading room, the perfect space for relaxing with the latest summer blockbuster before bed. The villa is set in a large garden with lots of shady trees and exotic greenery. Olive and palm trees give the house a real Mediterranean feeling, while the large stone terrace on the garden floor also has a magnificent and colourful array of flowers. The glamorous Roman-style swimming pool is the ideal spot to go for a dip or catch some sun on one of the poolside loungers. 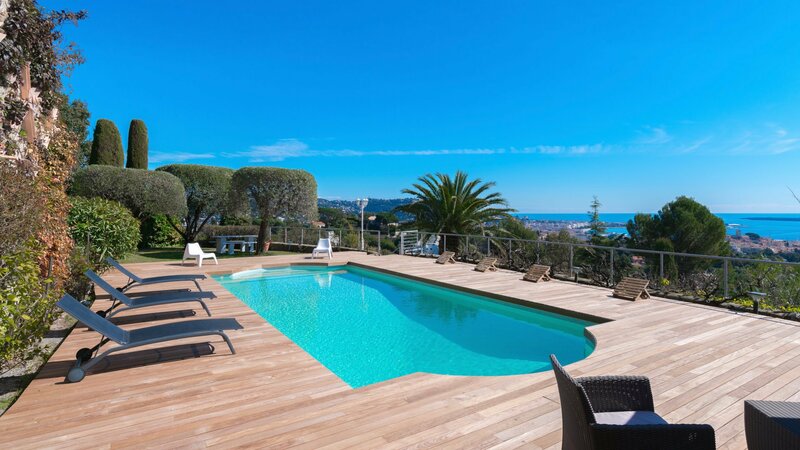 Surrounded by a comfortable seating area, the wooden patio around the pool is the perfect place to soak up the French Riviera sunshine over a cocktail or a good book. The house has several terraces and patios for guests to enjoy the outside space. The large terrace on the garden floor is a great spot for lunch or an aperitif while the extensive wooden patio with its chic white sunloungers is ideal for an afternoon siesta. If you’d rather beat the heat while you’re outside, the shaded courtyard leading off the kitchen is the perfect choice for lunch or afternoon tea.